How many times do you see amazing paintings and wonder how the artist came up with that idea. You may suddenly feel that your own ideas pale in comparison and leads you to the conclusion that you have a lack of imagination or creativity. Being creative is a very personal and subjective experience that is unique to each person, so there is no ‘one size fits all’ or magic bullet to make you more creative. But don’t despair! There are actions that you can take to bring out more creativity in your life. In fact, you are probably already more creative than you know. In this two part series, I’m going to give you some steps you can follow to open yourself up to creativity. The first thing we have to do is talk about creativity vs inspiration. 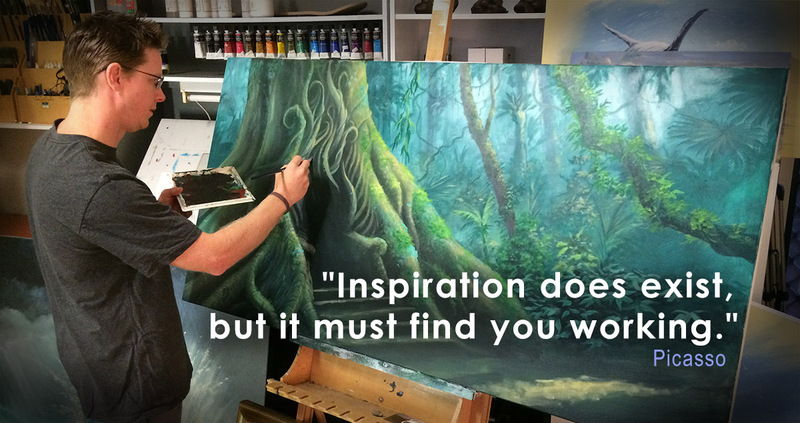 The way I see it, inspiration is what leads to your ideas and creativity is how you bring those ideas to life. People are usually blocked on one of these phases and when they are both working in harmony, we get art. Part One of this series talks about how to find inspiration – how to encourage and have ideas and what to do with the idea when we’ve got it. Part Two of this series explores ways to invite creativity into your life so that when you’re ready to have ideas, all of the groundwork is complete. What follows in this post are the steps I use to help me find inspiration when I need it (and to capture it during inconvenient times). Inspiration can sometimes be difficult to find, it is one of those things that almost never comes when you want it to and when it does come it can be during the most inconvenient times such as driving down the freeway, in the shower or lying in bed only half awake. The key to making the most of these moments of guerrilla inspiration is to always be prepared. You will never find me without a small sketchbook and pencils in my bag that I pull out whenever a moment of inspiration strikes. You could even install a drawing app on your phone if a sketchbook is too hard to carry. The reason that ideas come at those times is usually because we are in a more relaxed state during those moments. Our mind is free to explore ideas during that state. So the trick is to try and get us in that relaxed state more often and in times that are convenient for us to capture the ideas that may come. Relaxation is the key to ideas. We must clear our mind of the everyday clutter to allow room for inspiration. Inspiration comes when our mind can wander and explore our thoughts in abstract ways. The easiest way to clear our mind is to relax. I find that the best way to get into a creative state is to consciously relax somewhere outside of my normal environment. Sitting quietly in your arm chair in your office may be enough to slip you into a creative state, but more commonly it seems that consciously stimulating the senses in a place you don’t spend a lot of time, and that you find inherently peaceful and pleasant, can spark off some ideas. My favourite places to go are always in nature, the rainforest is my muse for many of my ideas. Even my backyard garden is a haven of inspiration for me. The inspiration for the series of artwork starring “Athyrium” came to me while on holiday in the rainforests of Daintree in Cairns, Australia. The magic combination of experiencing a different environment while in holiday mode, watching the light trying to breach the rainforest canopy, surrendering to the sounds, smells, and unusual shapes of the rainforest trees, all worked together to spark something in me that became these paintings. To discover your personal relaxation techniques and locations may require experimentation, and being aware of your own impulses and desires. Playing music and closing your eyes. The key is to be conscious of how you are relaxing and to consciously choose to invite creativity in. While you’re in this relaxed, peaceful state in your quietly stimulating environment, let your mind wander freely. Try not to force an idea to come simply because you have decided to enter a relaxed state. An idea may or may not come, and like taming a shy cat, a relationship cannot be forced to form just because you want it to be! Let whatever thoughts come into your mind stay there and follow them where they lead. Perhaps if you feel your thoughts are getting tangled in day-to-day details, you can gently remind yourself to let go, but there’s no need to exert any more control than this. It is important not judge your thoughts, no matter how ‘silly’ you may think they seem. Often our logical mind is very quick to analyse and shoot down thoughts that stray too far from familiarity, which can smother new ideas. If we give ourselves permission to ignore our logical, analytical thinking, we allow room for our silly ideas to grow. Who knows – maybe Star Wars would never have existed if George Lucas laughed at, “Orphan drinks blue milk and hangs out with a space crook and a walking carpet’. As Elizabeth Gilbert describes in her book Big Magic, ideas are like little creatures flying around looking to be brought to life – but like any wild creature, they hate to be forced or controlled and are unlikely to enter a mind that grasps desperately at them, or one that laughs at them. Create a welcoming mental space for your ideas to grow, and they may reward you. Say you’ve been sitting on that rock by the sea for a while and something has come to you. GREAT! Now hold it lightly and just see where it goes. Let your thoughts expand around this idea and let it grow. There’s no need to grasp it too heavily, just explore the idea by going over it many times. Repeating the thought or idea can help cement it into a more solid idea that can grow. You can allow other ‘silly’ ideas to join the conversation and see where they lead together. Maintain that feeling of relaxation and simply let your curiosity come through. Try not to put any pressure on the idea; it hasn’t even been born yet. You’re in your relaxed state, you’ve nurtured your idea, and now you have a pretty good idea what it consists of. The next step is to breathe life into it and bring it into the world. How you want to do this is up to you – you can draw it, you can say it out loud, you can write it down. I’ll talk about drawing it out, for now. You may find that your idea carries an emotional attachment, which you may experience as a tingling sensation or perhaps tightness somewhere in your body. You may not even recognise that there is a feeling, especially since you are now focussed on the idea and that’s fine too. When you are still emotionally connected to your idea is the best time to get it down – my wife Kathryn will tell you of countless times when I’ve been driving down the freeway looking for the next exit because something has come to me and I need to get it out of my head. At this initial stage of creation, keep everything really simple and easy. Try to draw with your emotions rather than focussing on how the finished picture will look. Stick figures and rough lines are your best friends right now – all you need to do is make sure you will remember your idea when you have some more time to dedicate to it. Remember nobody will see these except you so relax and keep that logical brain out of the way for now. Once you’ve got your raw idea out into the world, it’s a good idea to quickly draw it again, adding a little more detail so that you can capture more of your initial ideas and thoughts but still keeping it pretty rough. You may need to draw it several times in different ways to really bring the idea to the page, but only spend a minute or two on each drawing to start with. It’s a good time to put your ‘What if’ hat on and explore different ways of presenting the idea. Trust that each drawing will help to bring out more of the details of the idea. Once you’ve got a couple of rough sketches down and you think you’ve captured the essence of your idea, now you can let your logical mind have a little bit of input but notice if it starts to drag you back into a place of judgement and if so, take a deep breath and consciously go back to your relaxed state. You can speak directly to your logical mind and ask it to give you another five minutes of freedom and then you will listen to it. Letting your thoughts wander where they will. Keeping your chatterbox quiet and nurturing the idea. Seeing where the idea leads, it often leads to bigger, even better ideas. Bringing it to life. Roughly draw your idea a number of times until it takes shape. In the next blog post, we’ll talk about how to bring creativity into your everyday life and to be more conscious about the ways in which you are creating. If you haven’t already, make a beeline for my free Level 1: Introduction to Drawing for Complete Beginners series, where I’ll show you some of the very basic techniques you need to take your first steps towards drawing.